Quantifying what entails a “contact” that is sufficient to transmit a disease can be extraordinarily difficult, especially with a disease like influenza that can be spread with even casual incidental contact with an infected person. For influenza, social survey information is often used to quantify contacts, with probably one of the most comprehensive of these being the Mossong et al survey; they asked 7300 people of many different ages in 8 European countries to record the location (ie; work, home, school, etc), duration, and nature (ie; was touching involved) of all contacts they made during the day. The participants also recorded the age of their contacts. 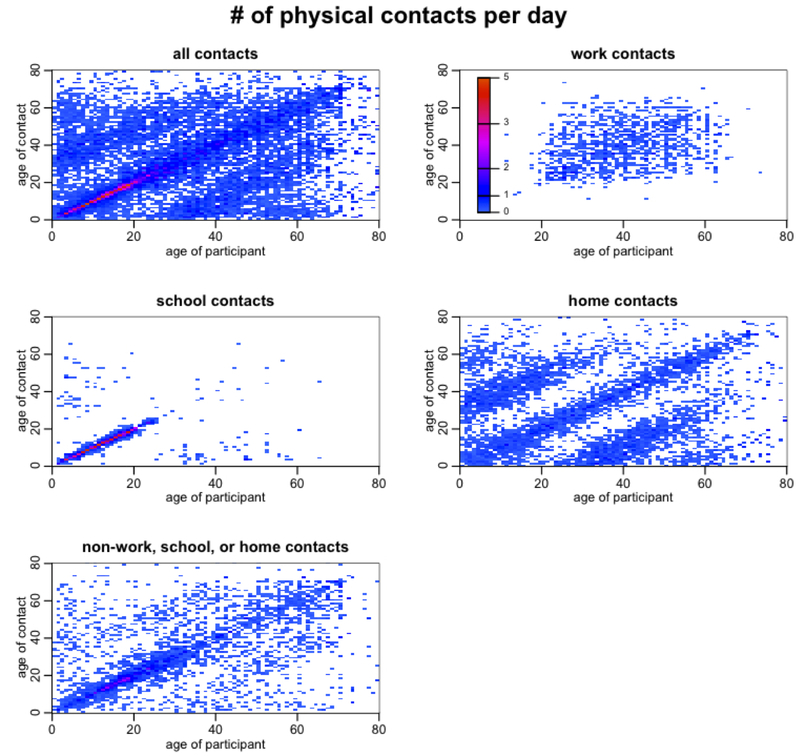 Notice that there is a strong tendency for people to prefer contacts with their peers. Can you also see that children also have a preference for contacting people around 20 to 25 years older than they are (particularly in contacts that occur at home)? And that adults have a preference for contacting people 20 to 25 years younger than they are (again, especially in home contacts)? This is due to child/parent and parent/child interactions. In the contact matrix for home contacts you can even see evidence of grandchild/grandparent and grandparent/grandchild interactions. How did I know that C_21 was going to be 3? Because the matrix has to satisfy reciprocity, meaning that within the population the total time spent by kids with adults has to equal the total time spent by adults with kids. Thus we must have f_i*C_ij = f_j*C_ji All contact matrices have to satisfy this condition. Note that in our contact matrix we are considering all contacts, not just the kind of contacts that might transmit infection. When we use this contact matrix in disease modelling, we will scale it to reflect “probability of transmission on contact”. where i and j are the indices of the age classes, and N_j is the population in age group j. The quantity beta is the probability of transmission on contact. The quantity gamma is the recovery rate. Note that in this simple model we assume that beta and gamma are the same for all age classes. This might not be true, and is an example of how this model can be extended. For now we will just consider the simplified case. Note that this model doesn’t include deaths or births, immigration or emigration, and also assumes that the time-frame of the epidemic is so short that a significant number of people in age class i don’t end up in age class j by the end of the epidemic. An excellent paper introducing how to calculate the reproduction number of compartmental models of disease transmission using the Next Generation Matrix method is P. van den Driessche (2016). For our two age-class example, the R0 is thus (beta/gamma)*9.93. Since we often have an estimate of the R0 of a disease like influenza from analysis of the rate of exponential rise of an epidemic (and we know the recovery rate, gamma, from observational studies of infected people), we can thus estimate the probability of transmission on contact. For our hypothetical population with contact patterns described by C above, and a pandemic-like influenza strain with R0=1.5, and 1/gamma=3 days, we can thus estimate that the probability of transmission on contact with an infected person is around 0.05. Note that the probability of transmission on contact folds in a bunch of different factors: for instance, it can be affected by the average proximity of contact, and also by the transmissibility of the flu strain itself (some strains of flu readily transmit between humans, but other strains, like H5N1, don’t). 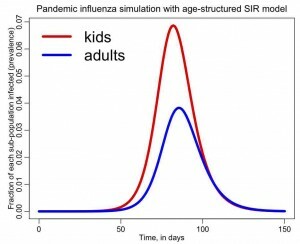 Thus the R0 of a flu strain depends not only intrinsically on the transmissibility of the strain itself, but also on human behavioral patterns that may make transmission more probable if people are crowded, or shaking hands or kissing a lot. You can see that the prevalence is higher in kids, and this is because of their higher contact rates. Children a super-spreaders of flu in the population, which is why it has been suggested that it is best to target vaccinations at that age group (even though most flu mortality is in the elderly). It has also been noted that flu incidence in the elderly can be significantly reduced with even modest reduction of contact between grandchildren and grandparents during the flu season. In this discussion we only looked at epidemic modelling with age structure. 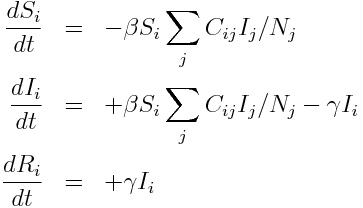 However, the model in the Equations above could easily be generalized to instead represent other stratifications within the population that may impact the spread of disease. An example is the male/female population structure that needs to be taken into account when modelling the spread of diseases like AIDS. Keep the row sums of the C matrix the same, but make all the contacts peer-to-peer (ie; all non-diagonal elements in C are the same). Given the probability of transmission on contact beta=0.05, how does this change the shape of the epidemic curve and final size estimate, relative to the previous estimates we obtained with the original sir_age.R file? Examine the effect of reducing just the kid-to-kid interactions in the C matrix given above (assume that beta=0.05). This is equivalent to closing schools. How does the final size of the epidemic depend on the fractional reduction in kid-to-kid contacts? How about vaccinations? If you only have enough vaccines to vaccinate 20% of the population, how should those be apportioned between kids and adults to optimize the reduction in the overall epidemic final size. This entry was posted in ASU AML610 Fall 2014, ASU AML610 Spring 2013 Lecture Series, Compartmental Models, Epidemic models, Lecture material, NEIU December 2012 Lecture Series, R, SIR model and tagged compartmental models, epidemic models, R, SIR by admin. Bookmark the permalink.